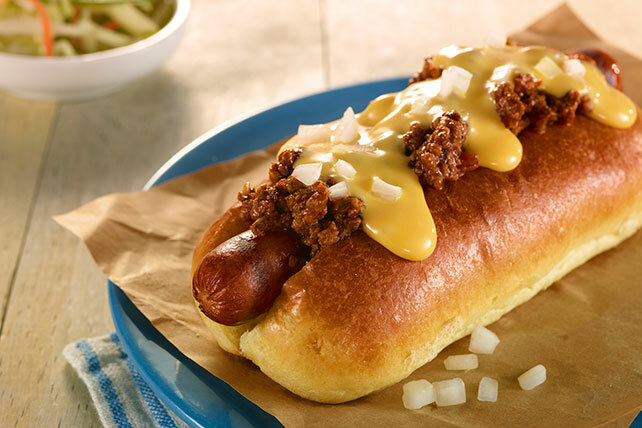 Check out our VELVEETA® Easy Chili Cheese Dog recipe for a quick and delicious dish. This easy chili cheese dog recipe is always a hit on the big game day! Meanwhile, cut VELVEETA into 1/2-inch cubes; place in microwaveable bowl. Microwave on HIGH 1 min. or until completely melted, stirring after 30 sec. Fill buns with franks; top with chili, VELVEETA and onions. Balance out your food choices throughout the day so you can enjoy one of these delicious sandwiches. To save time, microwave the franks as directed on package instead of grilling them.